The Luxbanx Duo Medium Rectangular Softbox from Impact is a versatile 24 x 32" light shaping tool for strobe, LED, and fluorescent lights. It's also useable with quartz lights up to 1000W due to its heat-resistant, textured silver interior. When using the Luxbanx Duo with strobes, both the front diffuser and inner baffle can be used for maximum softening of the output. When using it with hot lights the inner baffle should be removed. Open face lights can be used as is but it's recommended that you use the flood setting rather than spot on Fresnel sources. The softbox has 4 forward-opening vents to dissipate heat. Removing the front and inner diffuser essentially turns the Luxbanx Duo into a large reflector with maximum brightness and contrast. The versatile Luxbanx Duo has an additional control via an optional fabric grid which mounts to the recessed lip of the softbox with touch-fasteners. The grid narrows and concentrates the light's beam forward, controlling spill light and adding directional control to the Luxbanx Duo's attributes. The ample surface area and rectangular shape of the softbox make it ideal for large sets, groups, full length fashion, and large product work. Every Luxbanx comes with a carrying case and a spare Flex Rod. Separate purchase of a speed ring that matches your light's mount is required for use. Impact makes models to fit most popular brands. When using hot lights, the inner baffle should be removed. 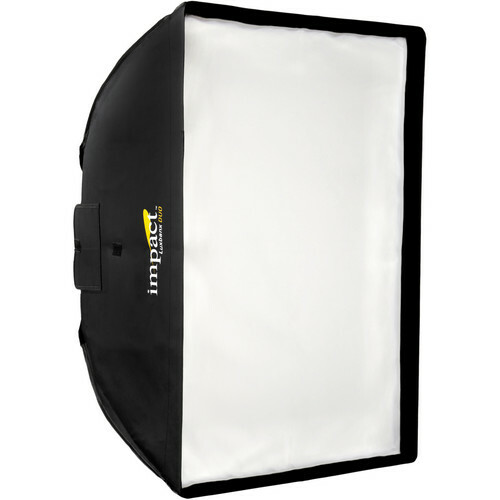 Box Dimensions (LxWxH) 26.3 x 10.5 x 1.5"
Luxbanx Duo Medium Rectangular Softbox (24 x 32") is rated 4.5 out of 5 by 6. Rated 5 out of 5 by Mark from An Inexpensive Alternative That Works This soft box is well constructed. Materials are not flimsy. Quality of light is excellent. Use it with large Photogenic strobes and Chimera speed rings. Velcro rear closures seal well around the speed ring. For quicker set up, pre-assemble the internal baffle and front diffusion panel. Or after the shoot, leave the diffusers in place for the next shoot. Front panel has velcro around its entire circumference, and getting it evenly positioned on the face of the box is a bit of a pain. Has clever air vents for hot light use. Comes with a bag, but you must remove the rods to pack the box into its case. Used Chimeras for years. This box stacks up well. Highly recommend this soft box. Rated 5 out of 5 by AquaPro from As good as much higher priced softboxes. I am a film and video professional with over 30 years experience. I use this Impact softbox with a 650 Arrilite and find it indispensable for quickly lighting interviews. The unit goes together fast, provides soft, even light and breaks down just as easily. It is well constructed of durable materials and even comes with a spare rod for that inevitable day when one goes missing. Rated 3 out of 5 by Maximiliano from It's a softbox, no real surprises here... Good softbox, rated for hot lights. I use it for film/ interview work. Works well. Includes extra rod. On the minus side I have to remove the rods to easily pack it back into its case. Not a big deal but slightly inconvenient. I'd buy another, you could certainly do much worse. Rated 4 out of 5 by Dave from Great Bank, Great Price I bought this little beauty to replace a small bank that was at the end of a good life.The build quality is very good and the light is clean. The price is good. It's exactly what I was looking for. I'll use it my studio and on location with strobes. Rated 5 out of 5 by kelly from Love my luxbanx It's feels nice and sturdy, and seems like it will last a long time. However it was very hard to put the braces into the ring. I work with chimera's and the Luxbanx are crazy stiff to get in there. Rated 5 out of 5 by Terry from I would buy this product over and over again! I use this product in my photography studio. It is a great product to use with strobes and hot lights. Will this Softbox fit the Impact octacool 9 fixture without any modifications or additional parts? According to the manufacturer, the Octacool 9 would be too large to fit this softbox. Impact offers speed ring for Lowel Tota light, but how do you mount this to a Lowel DP light? The Chimera Speed Ring for OctaPlus Light Bank/Lowel DP Light, B&amp;H # CHSRMLDPVPQ, would be the correct speedring for use with the Lowel DP Focus Flood Light, which you may use to connect the Impact Luxbanx Duo Medium Rectangular Softbox (24 x 32 ) to the Lowel DP Focus Flood Light fixture. What's the difference with MFR # 8101055? The #8101055 is for flash photography. The other is for continuous light sources because it's heat resistant up to 1,000W. Usually used for video lighting applications.